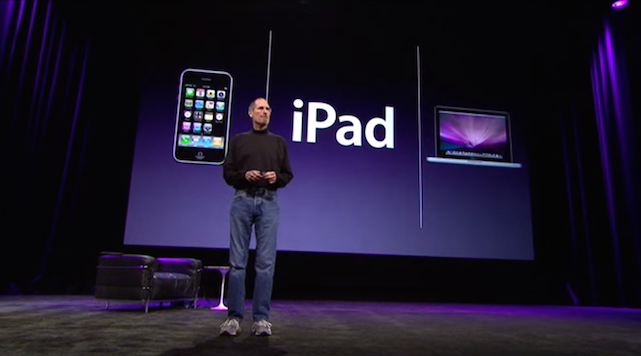 Five years ago Steve Jobs stood on the stage of the Yerba Buena Center for the Arts in San Francisco to introduce Apple's latest offering to the masses; the iPad. Launching on April 3 of that year in six configurations -- 16GB, 32GB, and 64GB with 3G or Wi-Fi internet -- some people weren't immediately sold. The numbers spoke for themselves; in just its first year 14.8 million iPads were sold by Apple. It was just the beginning for the tablet that would revolutionize the market. It all kicked off that day in San Francisco, so now would be a great time to relive the magic of the iPad's initial reveal. You can watch Jobs' announcement presentation right here for a look back iPad's first public moments. Enjoy and happy birthday. Happy 5th Birthday, iPad! originally appeared on TUAW: Apple news, reviews and how-tos since 2004 on Tue, 27 Jan 2015 18:00:00 EST. Please see our terms for use of feeds.